"Intelligence Squared U.S. Debates: Do Too Many Kids Go to College?" premiered September 2013. Two teams of dynamic leaders engage in a battle of wit to capture your vote. Think you know where you stand? Think twice. Intelligence Squared U.S. Debates invite the world’s leading authorities to debate the day’s most important issues. Two teams of dynamic thought leaders engage in a battle of wit and persuasion to capture your vote. 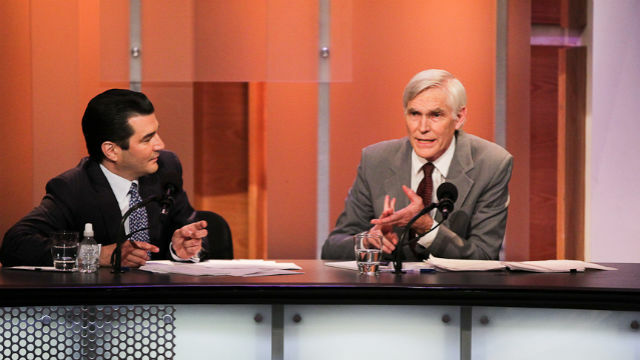 Recorded live in New York City for NPR and PBS, IQ2US debates are based on the traditional Oxford-style format, with one side proposing and the other side opposing a sharply-framed motion. Audiences vote before and after the debate to declare a winner: the team that changed the most minds. Always civil, respectful and thought-provoking, Intelligence Squared U.S. Debates offers a sharp contrast to the landscape of American debates. Now in it’s seventh live season and premiere season on PBS. Will you “think twice” and consider a new point of view? Now you can watch on PBS and join the debate online. Dr. Scott Gottlieb, resident fellow, American Enterprise Institute; Peter Huber, senior fellow, Manhattan Institute. The popular uprisings of the Arab Spring have left a leadership void that Islamist parties have been quick to fill. A longtime supporter of former strongmen like Egypt’s Mubarak and Tunisia’s Ben Ali, the U.S. now faces the uncomfortable result of Arab democracy—the rise of Islamist parties that are less amenable to the West than their autocratic predecessors. Will the Islamists, who once embraced violence, slowly liberalize as they face the difficulties of state leadership? Or will it mean the growth of anti-Americanism and radicalization in the region? It was 1971 when President Richard Nixon declared a "war on drugs." $2.5 trillion dollars later, drug use is half of what it was 30 years ago, and thousands of offenders are successfully diverted to treatment instead of jail. And yet, 22 million Americans-9% of the population-still uses illegal drugs, and with the highest incarceration rate in the world, we continue to fill our prisons with drug offenders. Decimated families and communities are left in the wake. Is it time to legalize drugs or is this a war that we're winning? On the fundamental question--evolution or creation?--Americans are on the fence. According to one survey, while 61% of Americans believe we have evolved over time, 22% believe this evolution was guided by a higher power, with another 31% on the side of creationism. For some, modern science debunks many of religion's core beliefs, but for others, questions like "Why are we here?" and "How did it all come about?" can only be answered through a belief in the existence of God. Can science and religion co-exist? A part of the Chicago Ideas Week, this debate is the first Intelligence Squared U.S. debate to be held live in Chicago. The herd mentality that assumes college is the only path to reaching one’s full potential is under fire. Student loan debt has surpassed credit card debt, unemployment for those with bachelor’s degrees is at an all-time high, and entrepreneurs like the founders of Facebook and Microsoft prove that extraordinary success is possible without it. But recent studies show that college is economically beneficial even to those whose jobs don’t require it. Is it still the best way to ensure social mobility, or is America’s love affair with higher education unjustified? Imagine a world free of genetic diseases, where parents control their offspring’s height, eye color and intelligence. The science may be closer than you think. Genes interact in ways that we don’t fully understand and there could be unintended consequences, new diseases that result from our tinkering. But even if the science could be perfected, is it morally wrong? Would it lead to eugenics and a stratified society where only the rich enjoy the benefits of genetic enhancement? Or would the real injustice be depriving our children of every scientifically possible opportunity? Intelligence Squared U.S. Debates are produced by Dana Wolfe and presented by WTTW National Productions. Melani McAlister: "Islam is Going to Have a Real Role"
Could Legalizing and Taxing Drugs Lower the Deficit?